spa day. I wanted to start at the foundation, the sole. 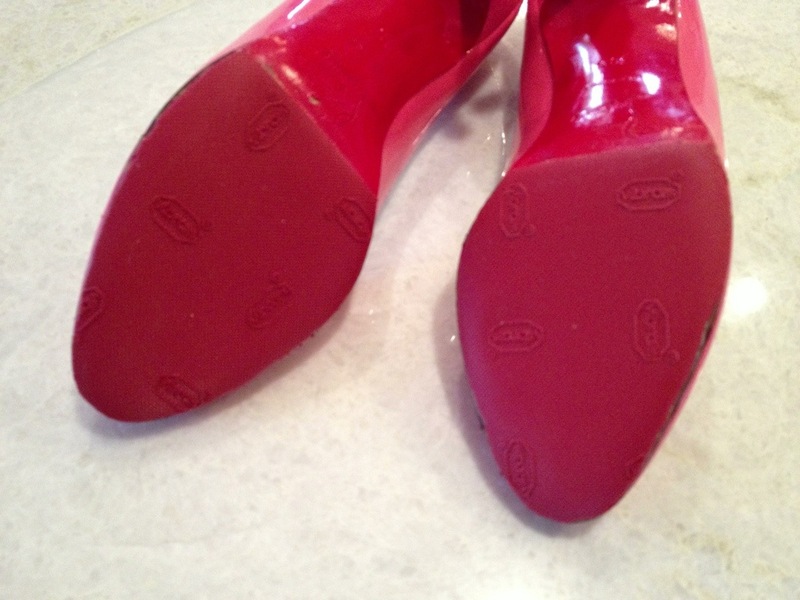 To restore/protect worn Christian Louboutin red soles, many turn to anti-slip rubber half soles (and their cobbler). I had a great local cobbler, but he is no longer working at that location and I haven’t been able to find him. I won’t trust my babies with just anyone. I have a few pairs I’d like to re-sole, so I thought I’d give it a try on a pair I wouldn’t cry over but would certainly get more wear out of after a few spa treatments (I have more plans for this pair!). If you try this yourself, there is always risk that it won’t turn out right so take your time and use a pair you won’t cry over! There really aren’t any great directions on how to do this online so I took my best guess. 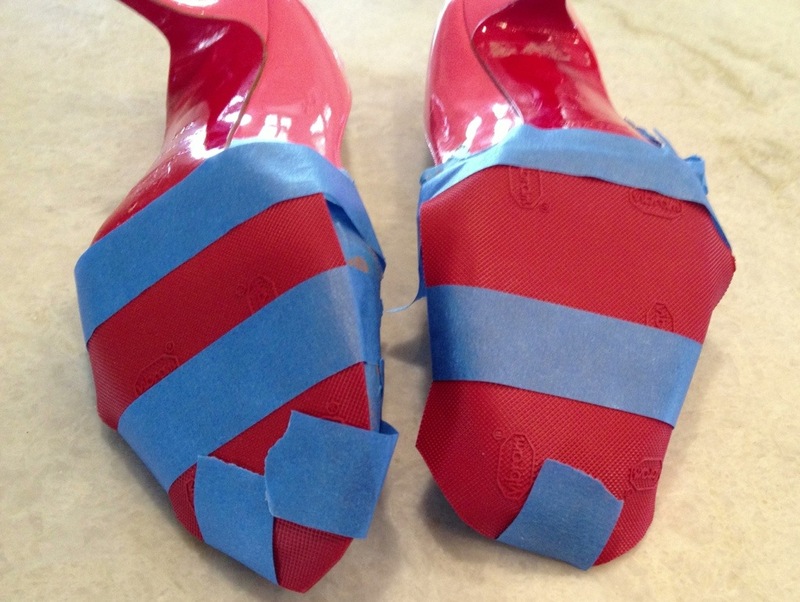 First I taped around the sold with the blue tape to protect the patent upper. I also put blue tape across the bottom as a guild line. Then I sanded the soles down with the orbital sander. 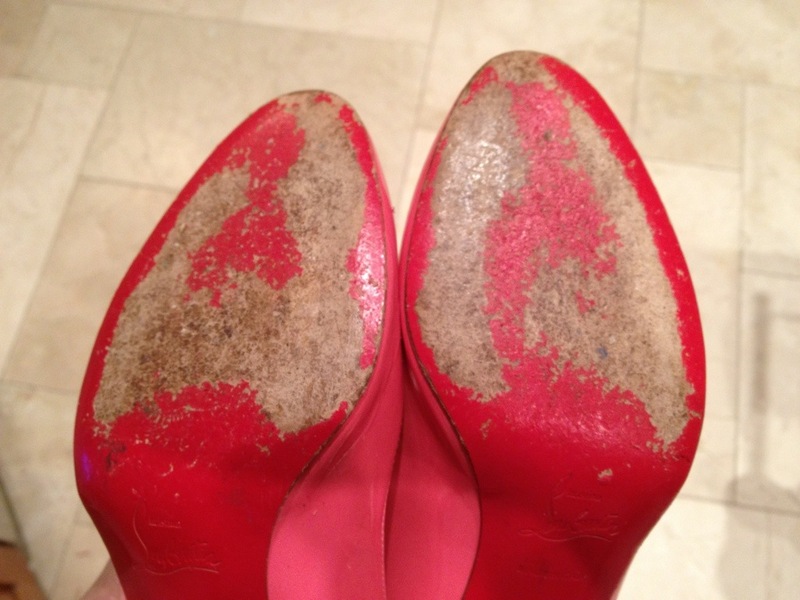 I’m sure this is painful to look at for Louboutin lovers, especially those still waiting for their first pair! I used a dry scotch-brite sponge to dust afterwards. 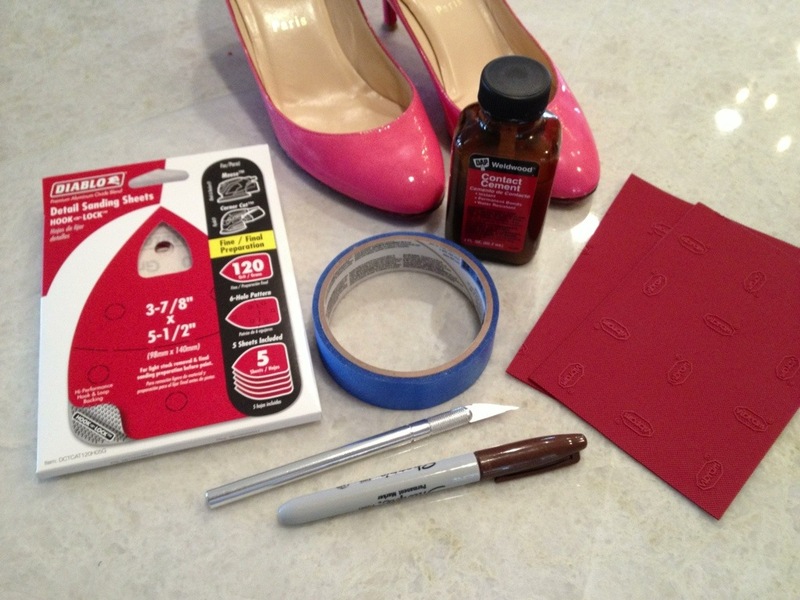 Ready to DIY your crystal Strass Louboutins? 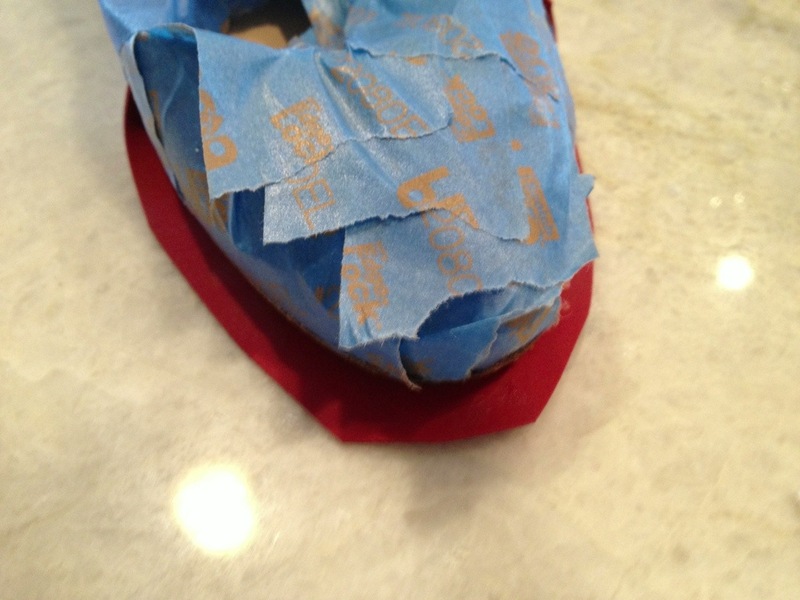 I also sanded down the back of one short side of each rubber Vibram to a point so this straight line that meets the original red sole wouldn’t be so harsh. 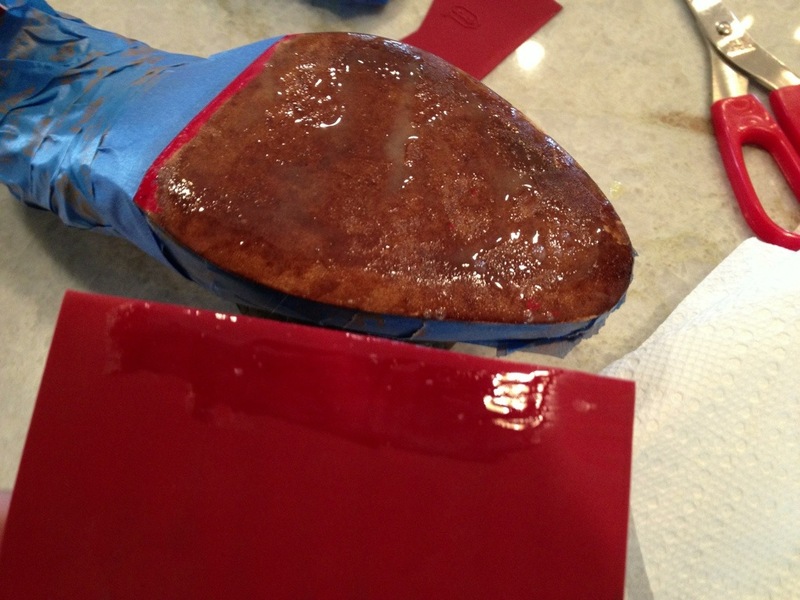 Then I slathered on the contact cement, making sure to carefully cover the complete edge mentioned above that will be the dividing line between the rubber sole and the original one. 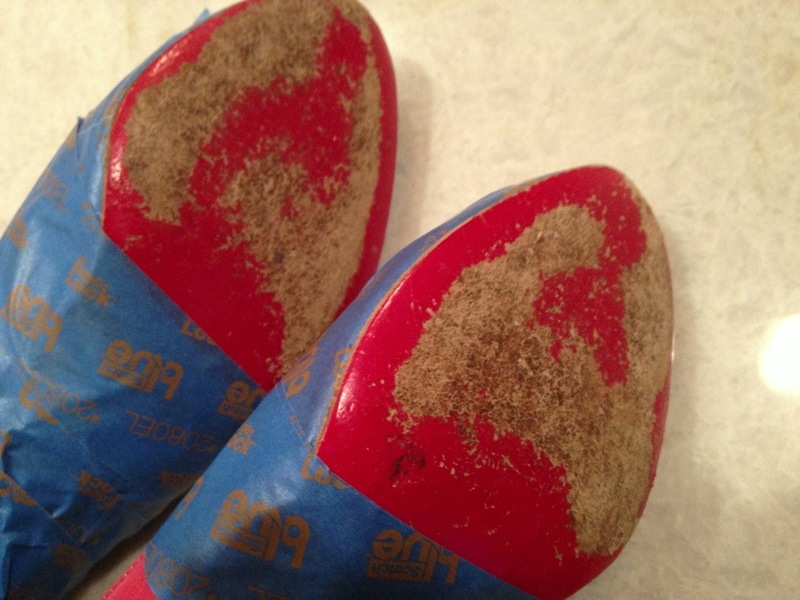 Brush contact cement onto the entire vibram and the entire sole. Then, contrary to everything you know about glue (because this is contact cement, not glue), I let it dry for 15 minutes as the instructions called for. It should be dry to the touch. 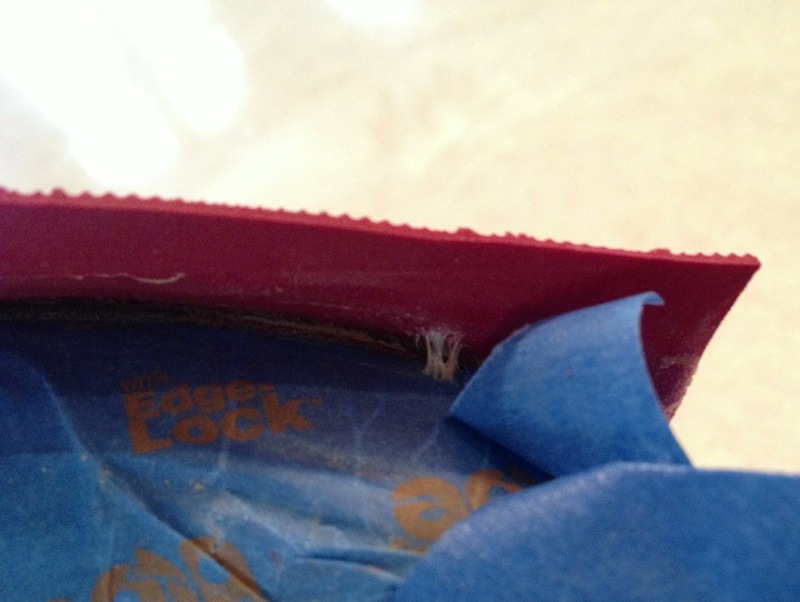 Unlike glue, contact cement works by adhering to itself. 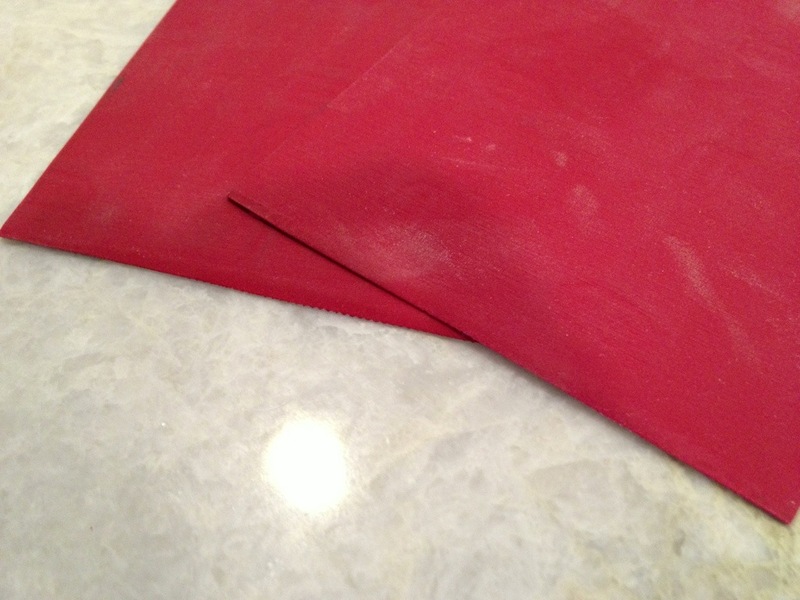 First adhere it to the two surfaces you want stuck together, then let it bond to itself. When the 15 minutes were up, I carefully aligned and stuck the red Vibram onto each sole — starting with the very important, now-tapered edge that meets the red sole. Then I roughly trimmed the excess. I went was over-kill with the blue tape, but better safe than sorry. It’s more important in a later when the exacto-knife comes out. 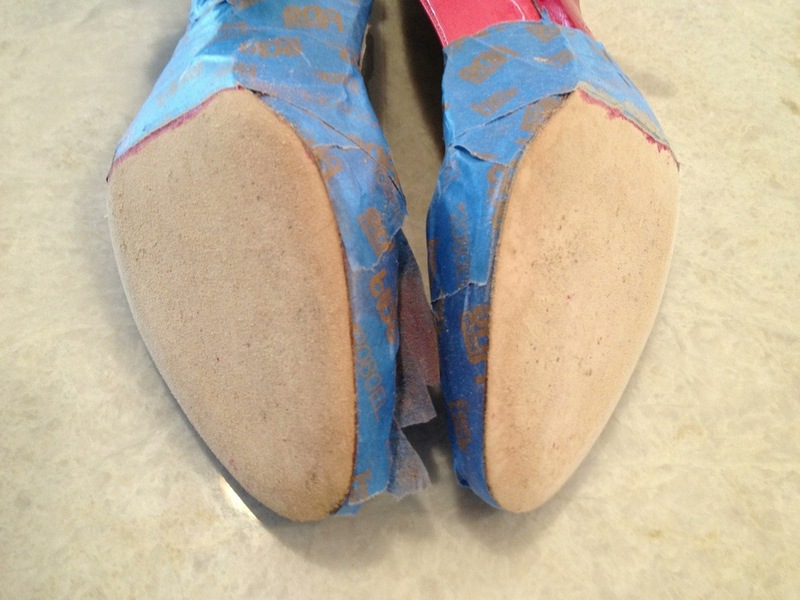 After smoothing everything out and loosely-taping the Vibram soles on (probably overkill), I set them outside in the shade and let the Texas summer heat, along with a little time, cure the contact cement. Here’s an example of why the blue tape is handy. 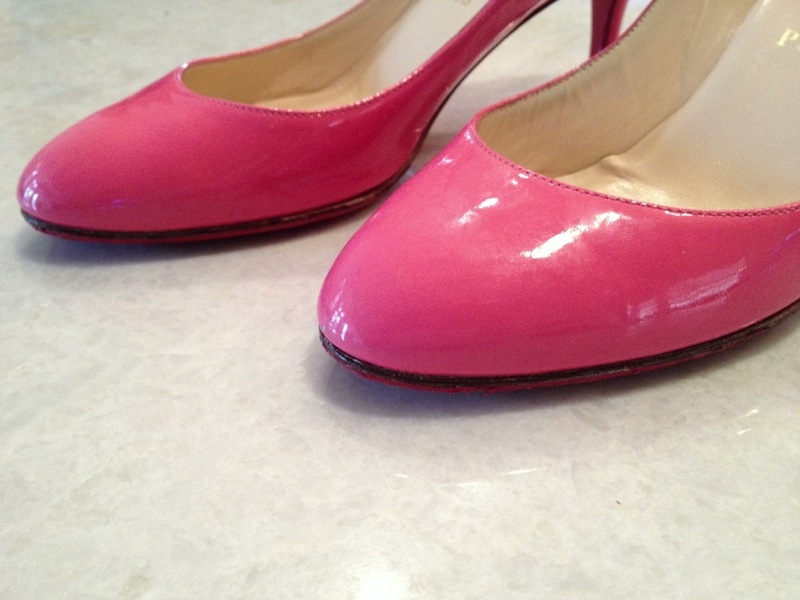 I hear you can use fingernail polish remover to remove any contact cement, but who wants to rub that on patent pink Christian Louboutins? Then I carefully trimmed around the soles with the exacto-knife. They aren’t prefect and my second shoe is definitely much better than my first. I think practice is very important in this step! Update: I found the best technique is to set the show upright so that the new sole is down and trim around the sole at a slight angle from this direction. Then I carefully re-colored the edge of the soles with the Sharpie, brown in this case, although others would need black. It helped hide some of my not-so-straight cutting. It’d be nice to still have a cobbler I trust, but it’s also nice to be able to do this myself. If I lived in NY or LA… somewhere with trustworthy cobblers who have worked with Louboutins before, I’d probably still take my favorites there. For a project pair like these, I’m happy with how they turned out. This isn’t the last you’ll see of these beauties. I have another project on deck!